The original deck layout of the Olson 30 was simple and useable but was setup more for short-handing than crewed buoy racing. All lines were led aft to the cockpit for one thing, and self-tailing winches were not standard on most boats at the time, so cleating was important as were multiple winches. 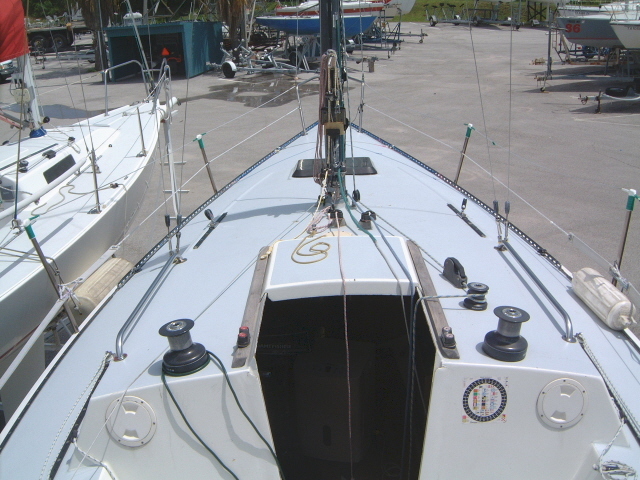 Many Olson 30’s that are raced primarily around the buoys have simpler layouts than the boats had originally. 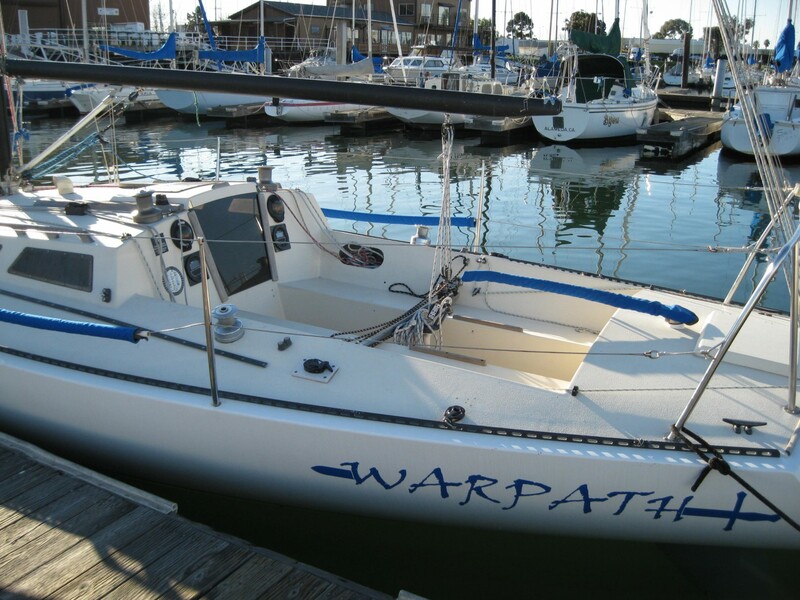 Warpath illustrates pretty well what a ‘stock’ Olson 30 looks like: Two cockpit primary winches with large cheek blocks aft of the genoa tracks. #1 and #2 are trimmed on the cockpit winches. 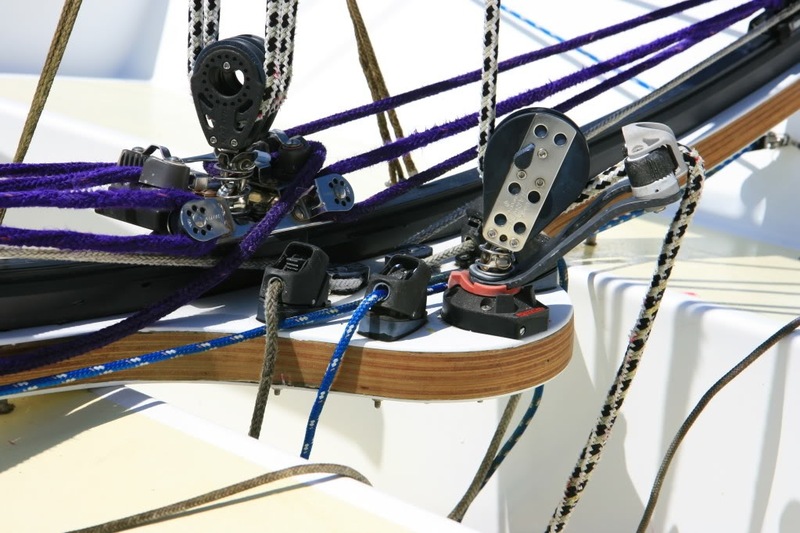 Cabin top winches are typically used for spinnaker sheets and also for halyards. Cabin top winches usually were non-ST which necessitates cleats which are usually on the teak companionway hatch runners. Two double or triple clutches forward of the cabin top winches. This boat has blocks on the toerail aft, these are farther forward than would normally be used for the spinnaker sheets. 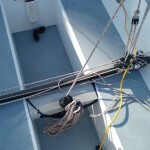 Better location for spinnaker sheet blocks is all the way aft near the pushpit support. Though Orcrist is not one of the top PNW boats, we’ve come a long way in the last few years making the boat more competitive with the better local boats as a yardstick. Because the focus in the Pacific Northwest is primarily on buoy racing and some moderate distance, protected distance racing, deck layouts on local boats are optimized for buoy racing in light to moderate conditions. The purpose of this article is to introduce some of the basic major concepts behind deck layout for buoy racing. Any benefits gained by an optimized deck layout are realized only with practice, familiarity, quality workmanship, and a good understanding of what you are doing. Ultimately, you and your crew will have to put in many many long hours discovering what works best for you. There is no “right” way to do any of this. If there is one thing thats annoying as a visiting crew-person on another boat, its a complex, unmarked deck layout. You want to contribute to the team, but when someone says, “blow the genoa halyard!” you can’t find it! You have no idea what this line controls, or that line, because they are all run weird, a cluster, or run inside the boat so you have no idea where anything is. Make your deck layout clean and uncluttered by getting rid of stuff you do not and will not need to race. For example, when I first bought my boat it had 2 primary winches in the OEM location aft of the genoa tracks, and 4 more small single speed winches on the cabin-top, for a total of 6 winches! No one needs this many winches on an Olson 30. In addition,there were cam-cleats, standard cleats, and cleats everywhere. Not everything was well positioned or thought-out. Now, after several years, we have stripped down to the bare essentials: two winches and a few cam-cleats here and there in critical places. The mast controls and foredeck controls will remain forward and not run to the cockpit. 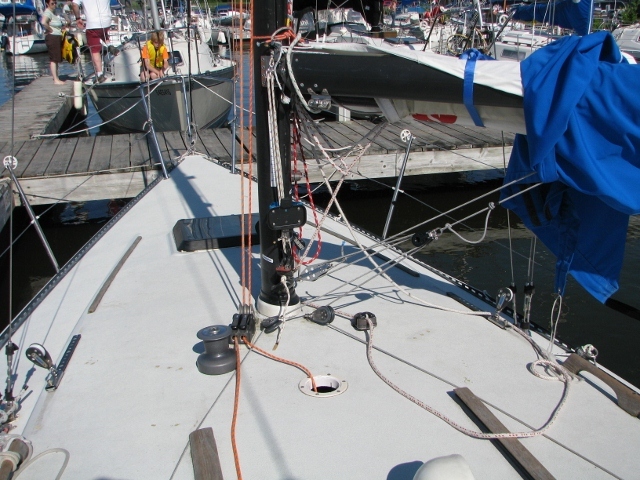 Halyards are jumped at the mast in this kind of setup and masts have cleats and often double-cleats. Some boats have removed the cockpit primary winches in favour of primaries atop the cabin. 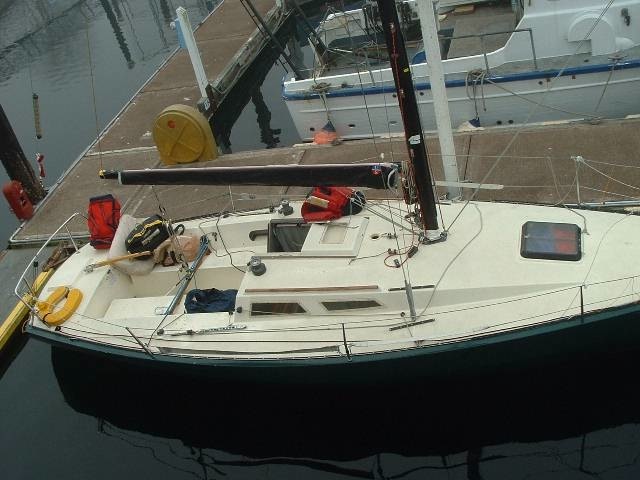 Blue Star – 8-time National Champion – uses cockpit primaries with a single cabin-top winch to port for the headsail halyard, leaving the halyard on the winch at all times for speedy headsail drops. 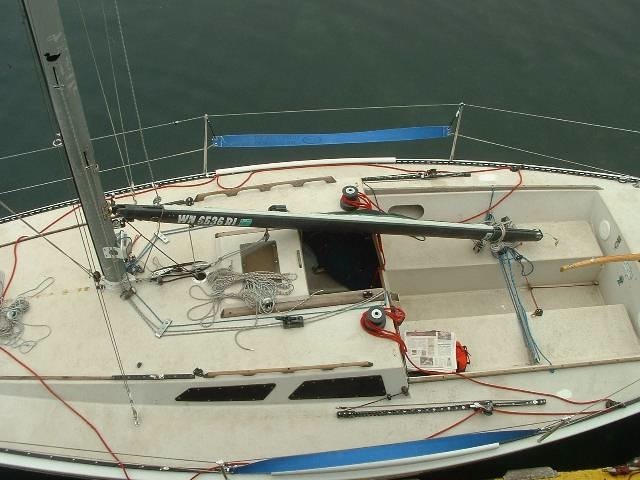 Singlehanded or shorthanded boats need much different layouts the buoy raced boats. Make your deck layout clear by marking all your controls with easy and accurate labels. Put labels on your rope clutches, put labels by the cam-cleats that lets your crew know what the control is. 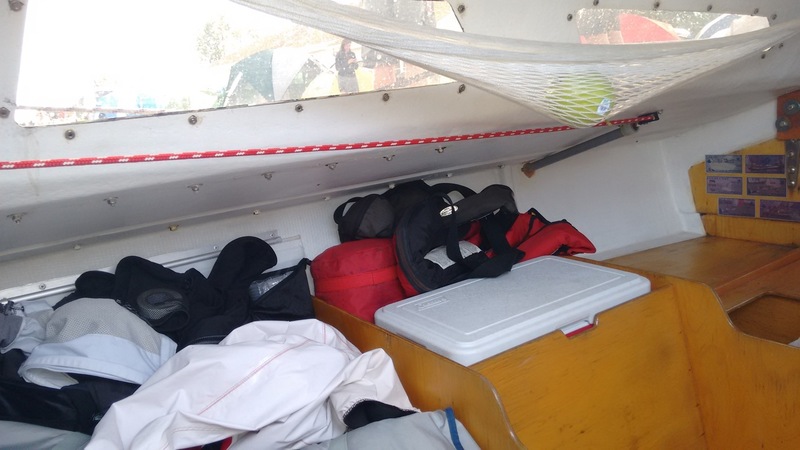 After a few weeks on the boat, the crew will learn the general location for things anyway, but for new crew, visiting crew, and in panic situations labels are important. Example 1: Lunchbox, owned by Mark Logan, Seattle. 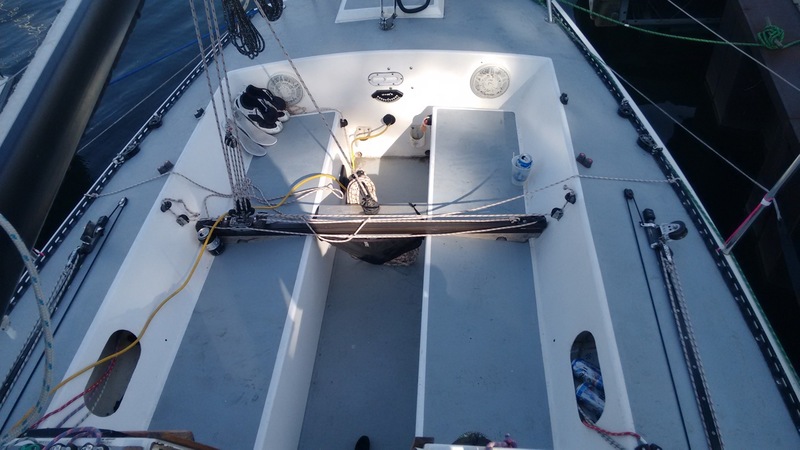 Lunchbox is a great example of a very clean boat. 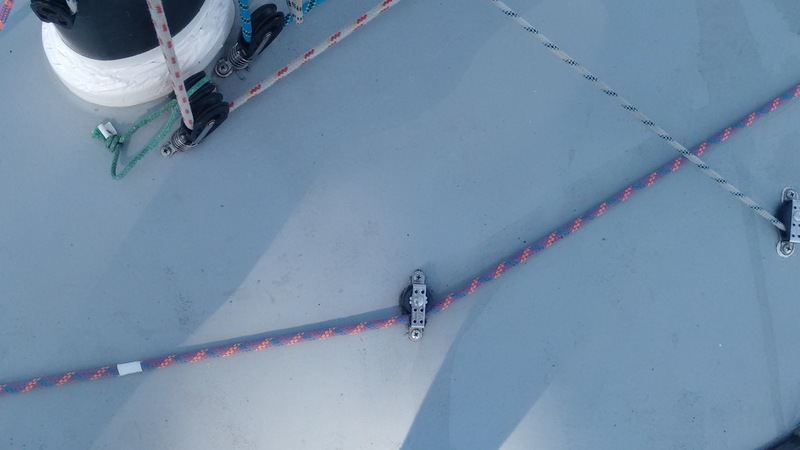 Two primary winches on the cabin-top are used both upwind and downwind. The genoa leads are adjustable, but you will notice that Lunchbox has eliminated most of the jib tracks on the deck. This boat sails with a #1 or a #3, and nothing else. Typically in Seattle a #1 will get you through about 80% of the racing all year. There are two large turning blocks aft of the genoa track to turn the genoa sheets to the primary winches (more on this here). The traveller and backstay tensioner are fairly standard. The spinnaker sheet is run in a normal way, through turning blocks all the way aft (you can see one by the yellow horseshoe buoy) and forward again to where they are turned to the primaries on the cabin-top. The downhaul is controlled from near the base of the mast, and is attached to some blocks on the front of the mast base. 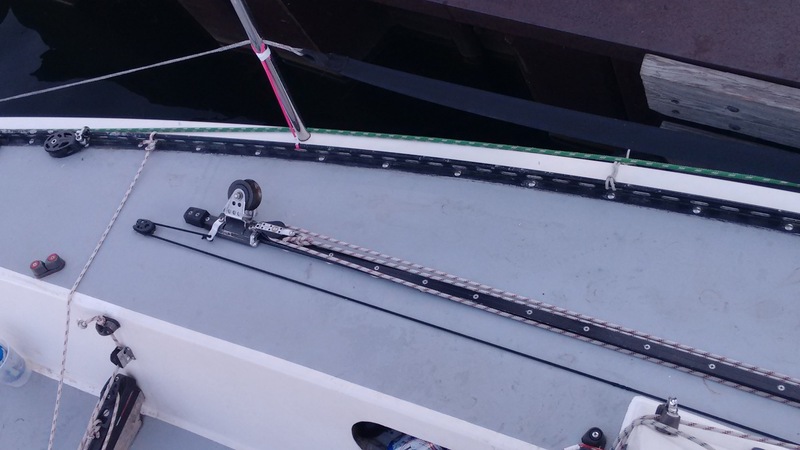 The genoa halyard runs out the starboard rope clutch near the mast base, and the topping lift is right next to it. You will notice no halyards are run aft to the cockpit. 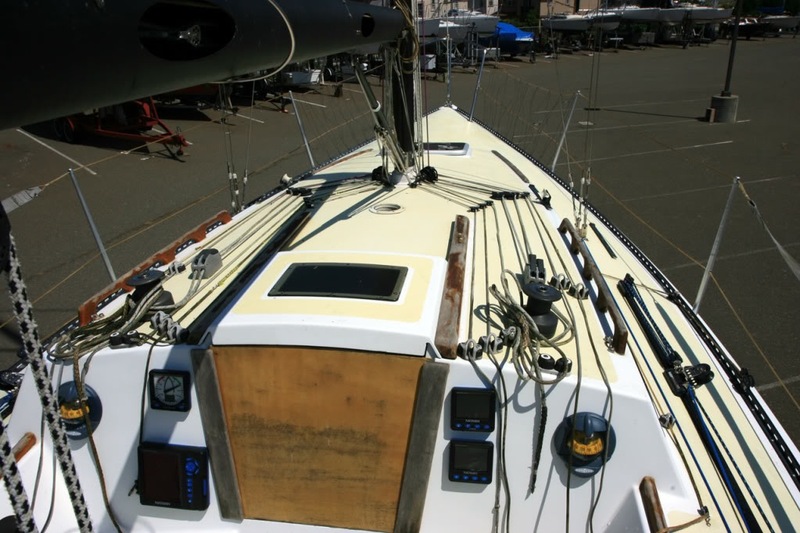 All these controls at the mast base make it easier for the foredeck to control things for which they are responsible: genoa halyard, topping lift, spinnaker halyards, and so on. Enigma is another great example of a clean layout, with some noticeable differences from Lunchbox. You will notice again that there are two primaries, and that much of the genoa track has been stripped from the boat. In this case, the outside track for the #3 has also been removed. This boat will therefore only sail with a #3 closely sheeted, or a #1. Adjustable genoa cars lead to a large turning block that is affixed to the toerail, instead of mounted on the deck. On Orcrist, we use blocks mounted to the deck, but this is personal preference. Notice on Enigma that halyards are led aft. Both Enigma and Lunchbox do a fair bit of Spring distance racing, so this is a personal choice. 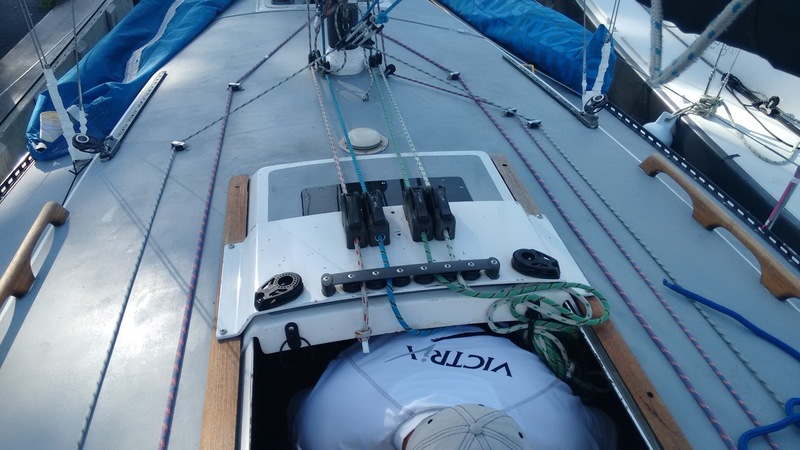 One thing you will note is that Enigma runs their backstay adjuster through their cockpit drain pipes. Bad Dog does this too. Notice that Enigma has some great webbing hiking straps, and pvc pipe over the toerail to make hiking hard as comfortable as possible. 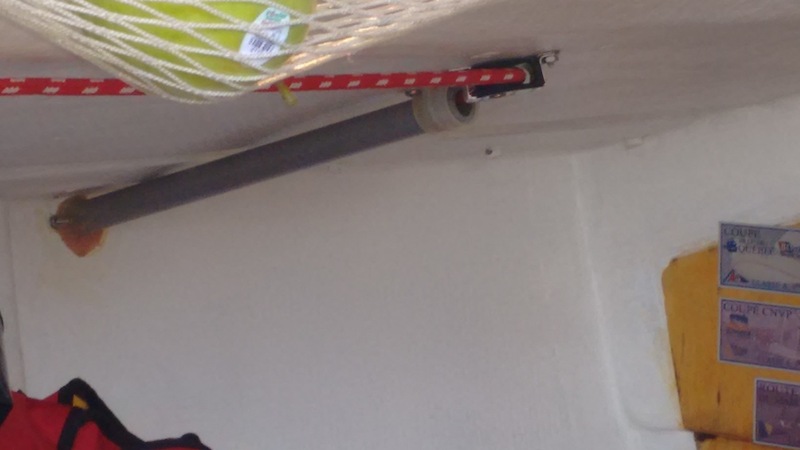 • The genoa halyard Locate the rope clutch at the base of the mast (example: see Lunchbox). • The topping lift Place on or near the base of the mast, on the starboard side so that a crew person can adjust the height of the pole while hiking on the rail (example: see Lunchbox). • Adjustments to the downhaul Some boats locate the downhaul controls near the base of the mast. Others run the downhaul back to the cockpit and make it a responsibility of the active guy trimmer. • Adjustments to the cunningham Some cunninghams are attached directly to the base of the mast or the boom. Few competitive boats have not realized the benefits that moving the primaries to the cabin-top bring. While the Olson 30 came with primaries mounted aft of the genoa cars, you will find very few of them on racing Olsons in this location today. The benefits are primarily weight related: someone grinding the genoa on a cabin-top winch is closer to the center of the boat. After a tack, the weight of that individual is no longer on the low side, rather further to windward. Additionally, the extra leverage a person can get while standing rather than crouching over the winch on the low side is significant. Finally, trimmers can keep their weight centered and forward, key in both light air upwind, and any air downwind. The effect or moving the winches can be more dramatic than you realize! Moving the winches is easy and takes a day or two of careful preparation. As with anytime you drill holes in your balsa cored deck, you should take extra precautions to make sure the holes do not permit moisture into the boat or core. This is done with epoxy and routering out the old core. Ask if you need more information. Remove the old winch and seal the holes. If the core was rotted underneath the old winch, take some extra time to dry out the core and seal it correctly once the moisture is out. The winch is removed and the holes cleaned out, dried, and epoxied. Notice the OEM Shaeffer turning block. Its fine in this location, but the core underneath might be wet. Now is a good time to find out and service it if necessary. Now prepare the cabin-top and mount the winch in the new location. 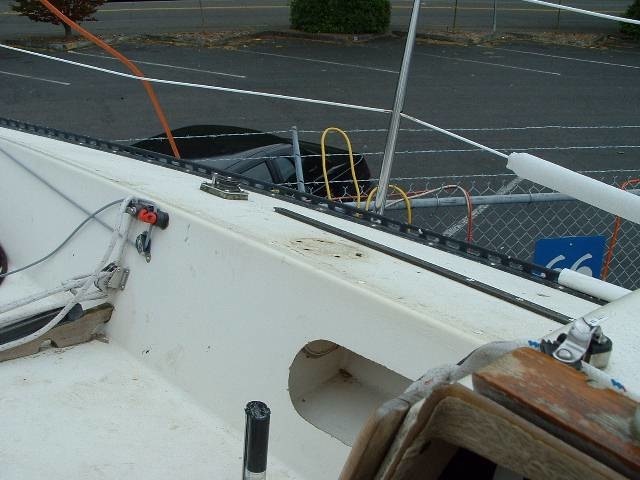 The cabin-top on my boat was thicker than the original location for the winches, and I was not able to reuse the bolts. 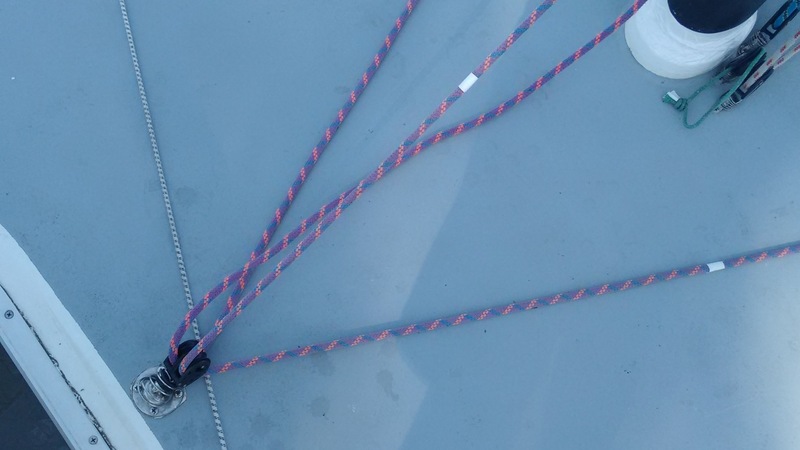 Some boats elect to add some nylon backing for the winches in their new location, however I feel that the deck here is strong since it is so close to a corner, and backing shouldn’t be required if the core is dry and you prepare your holes correctly. Mount the winches in the new location. Refer to an owners manual to see how the bolt hole pattern should be mounted relative to the direction of the load on the winch. For now, you can use the OEM (Shaeffer) turning blocks or mount some to the toerail (see Enigma). Go sailing and get used to the arrangement. Barient 23 self tailer mounted in the new location. Note places where unnecessary deck hardware has been stripped over the years. 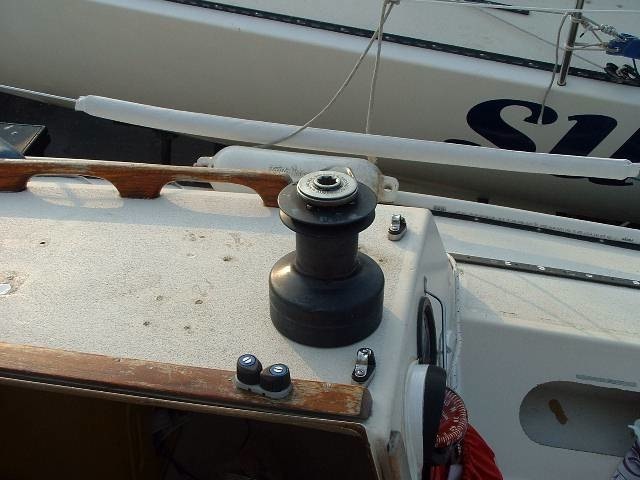 You will find that the trimmers now stay closer to the center of the boat on all points of sail. Upwind, the trimmer trims from the center while the tailer is higher, perhaps even on the rail. 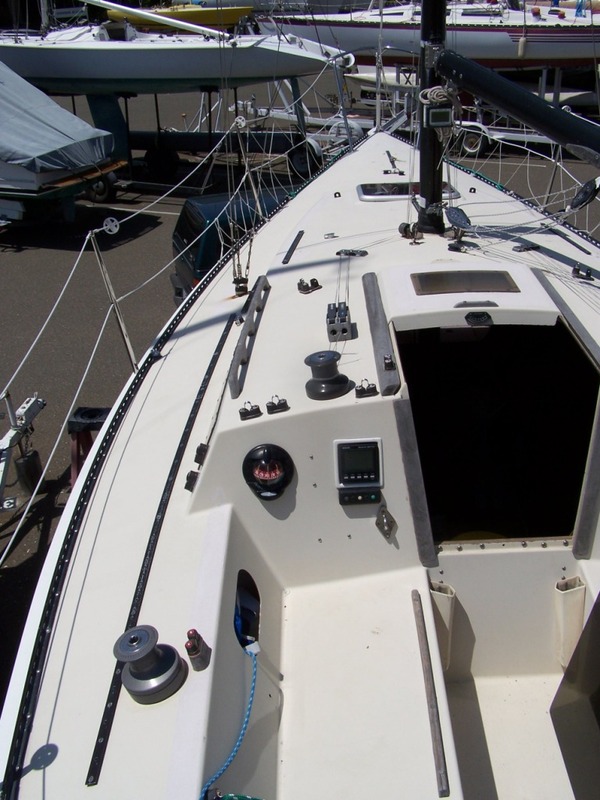 Downwind, the trimmers are inboard, behind the bulkhead or even in the companionway. If you are cross-sheeting in light or moderate air, the trimmers can trim from the windward rail. Tacking becomes extremely fast! This is close to the original layout. Cockpit combing removed, triple cam cleats atop cabin for control lines and twings. Primaries atop cabin and single small cabin-top winch and dedicated single-line clutch. Line organizers removed. 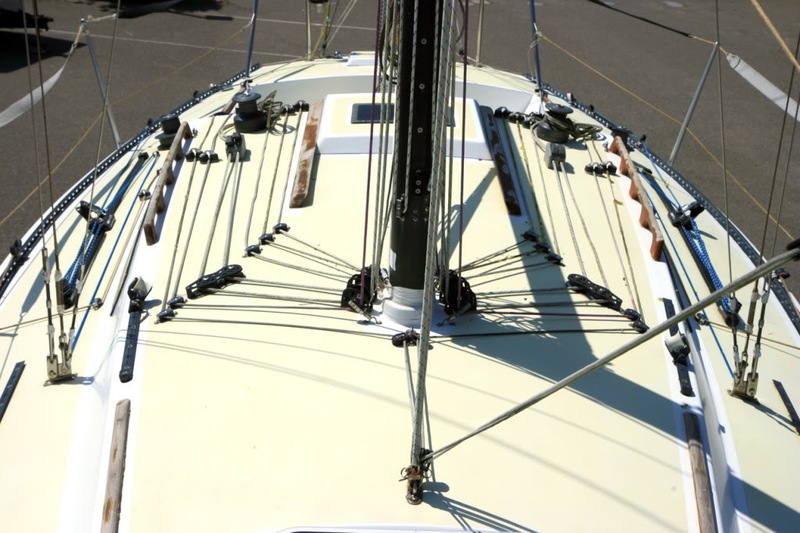 Vang and spinnaker topping lift on center mounted cam cleats. This spartan layout works well for a boat that has foredeck crew. 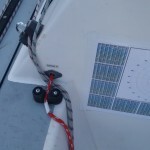 Single small winch to port with a dedicated double line clutch for spinnaker and headsail halyards. Topping lift on camcleat to starboard mast base. 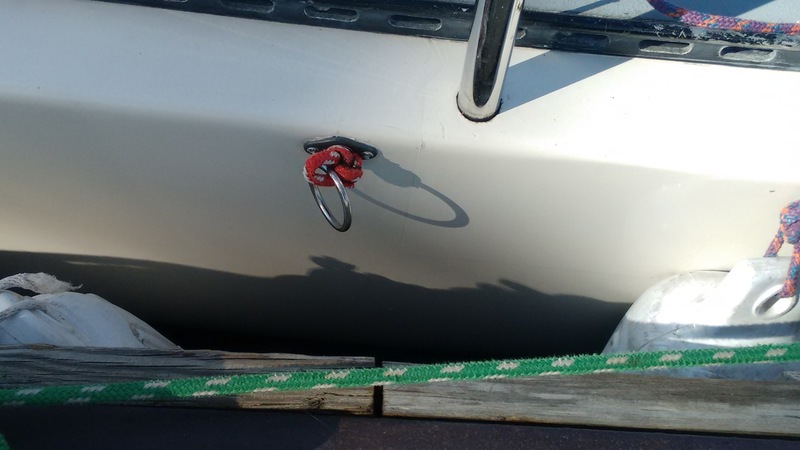 Note use of lifting eye access cover hole for halyard tidying. 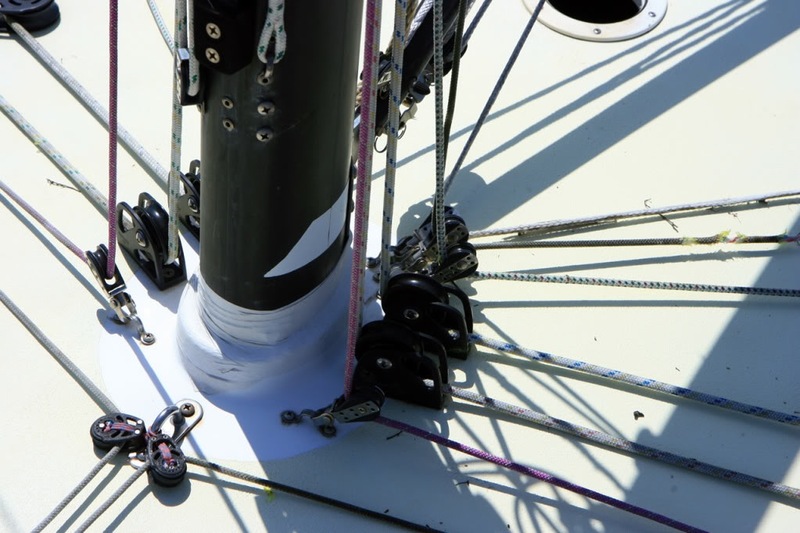 Victrix has adjustable Harken genoa cars, windward sheeting traveler and a modifed mainsheet. Cockpit is set up so all sheets are run across the cockpit to the windward (high) side. One of the key modifications to Victrix is the pit location for the clutches. An aluminum bridge sits on top of the companionway hatch slides. Cheek blocks on the corners of the bridge can be used to sheet the #3 to the windward cabin top winch. This bridge setup also removes a lot of clutter from the cabin top and locates the clutches in a great spot for the pit man. Also of note are the controls for vang and foreguy which are both double-sided so they can be always be trimmed from the high side. Twing control line runs in a plastic conduit through the hull, then aft through the edge of the cabin wall. Twing control where it exits the cabin. This system keeps one extra line off the side deck and places the control is a great location. We don’t want to use the photos below as a “What no to do” exactly, but it’s clear this Olson owner didn’t get the email about simplifying the deck layout. There are different ways to approach a given problem, that’s for sure! This owner had something different in mind when modifying his Olson. We’re not sure what these lines do, but there sure are a lot of them. Extra lines control spinnaker mast cars, but we count 14 in all. Lots of time and money has been spent on outfitting the mast base area, but it’s very complicated. The traveler system has been modified with a new base and lots of new control lines.